It was a night of celebration. A night to celebrate the careers of Elin Gustavsson and Ellen Nystrom, both of whom will do down in history as two of the best players to ever wear the green and gold. THe individual numbers they have produces are amazing. More importantly, they came to play every night for four years; Nystrom has started every game in her career and Gustavsson has started all but one. It was a night to celebrate this 2016-17 team for their regular season MWC Championship. They had wrappped up the conference championship last Saturday in San Diego and it was a chance to recognize them in front of their faithful fans in Moby Arena. Every year plays out differently and this one was special. Picked as PreSeason favorites even though they lost two All-MWC players and 4 of their top 6 players, the external expectations were probably too high for this team. Needless to say, they responded magnificently. It was also a night to recognize Nevada’s lone senior Stephanie Schmid and their outgoing coach Jane Albright. Albright has a long and storied career, winning over 500 games at Northern Illinois, Wisconsin, Wichit State, and Nevada. CSU always does a beautiful job of acknowledging their opponents on Senior Night and this one was no exception as Nystrom and Gustavsson presented bouquets to Schmid and Albright. It started slowly as both teams struggled to find the basket. The first quarter ended with the Rams leading 8-6 and the second quarter was crawling down a similar path until CSU junior guard Hannah Tvrdy took the lid off the basket with a 3-ball. Nystrom quickly followed with a blow-by layup and the Rams were on their way. They opened up their lead to 14 before settling for a 9-point halftime lead. The Wolf Pack hung tough through the 3rd quarter but when the Rams scored the first 8 points of the 4th, their lead had grown to 18. The outcome had become a formality and there was only one thing the crowd cared about at that point The moment to acknowledge Ellen and Elie. It came with about 2 minutes remaining as they were substituted off the floor together. The crowd stood and loudly acknowledged their efforts of this evening and all of their other efforts. They hugged their coach and then sat down. For the record, Elie scored 20 points in her final home game. Ellen scored 19 and finished off a double-double with 10 rebounds. Tvrdy was the only other Ram in double figures with 13 and she showed why she will be the leader of the team next season. And then it was on to the festivities to celebrate the careers of Ellen and Elie. Lots of smiles, a few tears, but mostly the warmest of feelings as the enormous talents and hearts of these two incredible young ladies were acknowledged for the final time. The most touching moment was the playing of the Swedish National Anthem as Ellen and Elie, draped in the flag of their native country, led family and friends in singing. 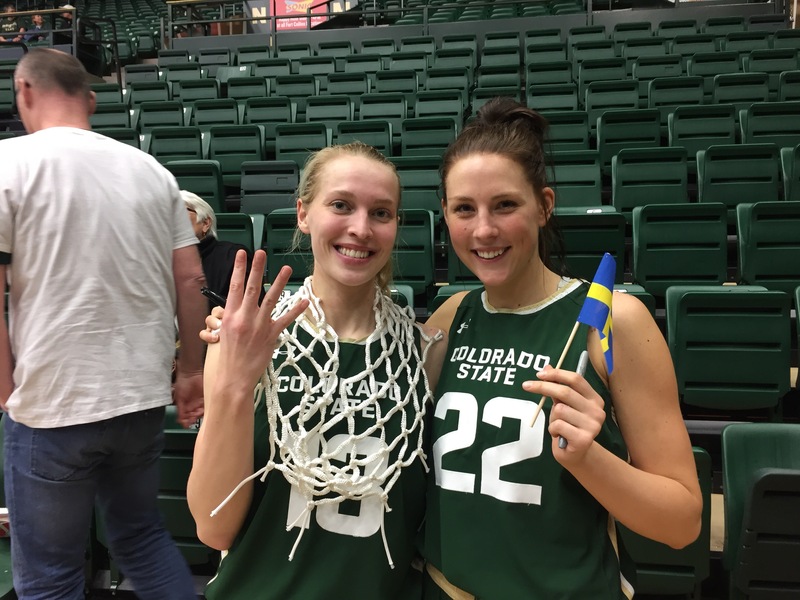 It was a fitting way to close out the Moby careers of the Fabulous Swedes.